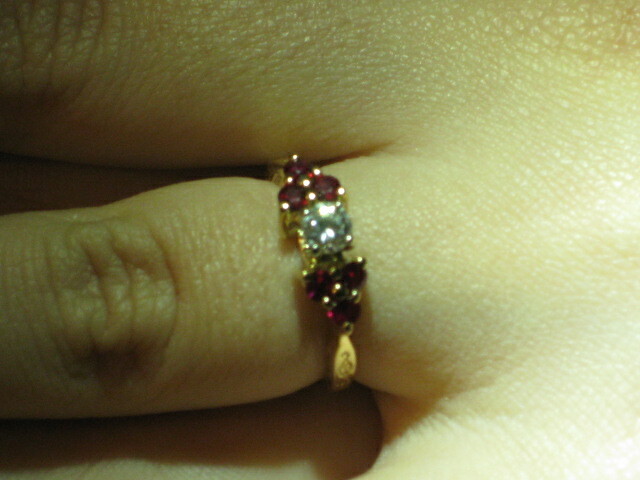 Once you have made the big decision and have decided to ask the one you love to spend the rest of her life with you. Now you must go on a quest for the perfect ring. It may seem like a daunting task but it won’t be, if you keep a few things in mind. You will find the perfect ring in no time. First, you must keep in mind your loved ones choice in jewelry and also your budget to find the perfect ring that will fit your needs. Take a look at the jewelry she wears now to get an idea of what type of style it is and also does she prefer silver or gold. The type of jewelry she prefers whether it is bold or vintage will also give you an idea of what type of ring she might prefer. Another thing to consider is the shape and setting style. The number one choice chosen by most brides to be are round diamonds. Other styles to choose from include; oval, pear-shaped, square and heart shaped. There are also different settings to choose from, such as; a solitary diamond set alone in a band or a band with stones embedded in it. The type of rings she wears now may give you some clues about what style she would like. The size and shape of her hands and fingers will also make a difference in which style and type of ring will suit her best. If she has short fingers an elongated diamond such as an oval or marquise can make her fingers appear longer. If she has long fingers a wideband ring will make her fingers appear shorter. Bold ring styles look very nice on long fingers. If she has larger hands a small delicate engagement ring could actually look smaller on her finger. There are also several different precious metals to choose from, including, gold, silver, platinum and palladium. Most women have a preference of which type of metal they prefer their jewelry to be made of. Some women prefer the “white” look of white gold, platinum and palladium. On the other hand, some women prefer gold. 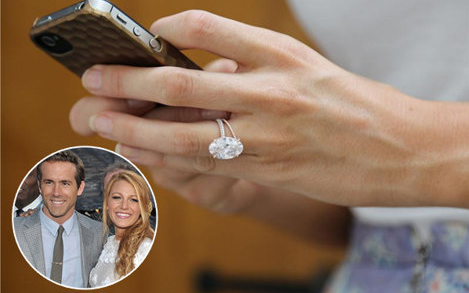 If you notice the jewelry she wears now you should be able to determine which metal she would prefer for her engagement ring. If you are unsure of what exactly she would prefer you can always try to be subtle and get hints from her on what she likes. Another good idea is to enlist the help of a family member or a close friend of hers to help you make the choice. Make sure you choose someone who knows her likes and dislikes and also someone who can keep the ring a secret. You can also browse online or in your local shopping mall to get some ideas. Choosing an engagement ring can seem like an overwhelming process. If you pay close attention to what your loved one says and the jewelry she wears you will make a perfect choice. You will find the perfect diamond and setting that she will cherish forever. Although the holiday season is one of the most wonderful times of year, it can also be one of the most stressful as we scurry to â€œget it all done.â€ It’s important that we do not allow the hectic holiday pace to overwhelm us. We must take the time to do something special for ourselves: dine with those long lost friends whom you have been meaning to call, laugh through the tacky light tour with friends and family, or simply sit in a warm bath for peace and solitude. We must remember to recharge our batteries because if we are not well charged those around us will notice our dwindling light! Let your light shine by exhibiting patience and practicing random acts of kindness such as becoming an angel by buying a toy for a child in need. Be positive in your mind, and in your interactions with others. You will find that your attitude will spread like the flu! It is the little things that make a big difference in life. Shop online! Shopping online is a good way to get a head start on your holiday gift giving plans. Web shopping has never been more secure or convenient and many online retailers are even offering free shipping. Easy returns and great bargains can also be found. Most of your favorite stores have easily navigable sites to lead you to the perfect gift. Buying online allows you to stroll though the mall and enjoy the decorations without having to deal with hectic crowds, long lines, or the burden of carrying heavy packages. Classic gifts! Jewelry and electronics will always be popular. No one can have enough jewelry, and companies are constantly updating electronics. These gifts are always appreciated and there is no worrying about getting the right size, unless of course you are purchasing a diamond engagement ring. Some websites offer free ring sizers and have tips to determine that special someone’s ring size, so if you have your heart set on a diamond ring, finding the right size is easy. Most women love jewelry and men always want the latest electronic gadget. Make memories! 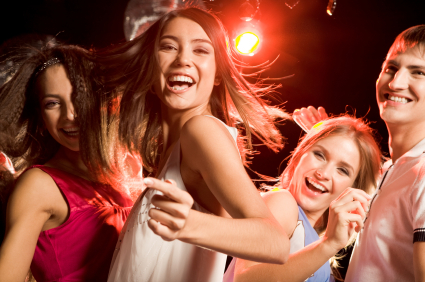 Movie tickets, concert tickets, and game tickets are fun and memorable gifts. If the receiver has a favorite musician or team, hop online and see when the next show or game is. Crafty ideas! If you would rather put your talent and time into crafting a present, here are some good ideas. Create a box full of love. Cut out hearts, write something special on each heart, and fill a shoe box with reasons for loving the receiver. Or you could create a memory book. When creating this type of book it is important to pick a specific time in one’s life to cover, for example a college career or a trip oversees. Fill a book with pictures, brochures, ticket stubs, and cards to remind someone of a special time in their life. A third idea is to print T-shirts. If you and a group of friends have recently done something fun together, grab a picture, think of a funny catchphrase, and put it onto a T-shirt. Remember the best gift you can give your friends, family and community is the gift of caring. Continue to give your best, even if it is just picking up some litter along the street, sharing a smile with a stranger or letting someone cut ahead of you in traffic. It matters, it’s contagious, and it will make you feel great! Happy Holidays! – Plan ahead and make lists. – Do more shopping online. 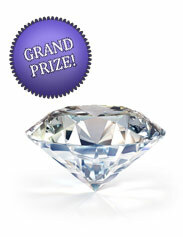 Gifts such as jewelry, electronics and event tickets are especially appreciated. – Have lunch with an old friend. – Shop with friends who are looking for similar presents. – Give to the needy. Deciding to propose to the special somebody in your life is a huge decision, one that will lead you down a path of even more decisions. Of course, the first thing that needs to be decided after you’ve decided to propose is what type of engagement ring to get. Between diamonds and settings there are so many choices that it can be overwhelming. Hopefully this can be cleared up. 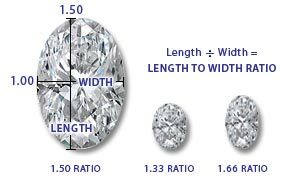 While you’re probably more than familiar with the 4 C’s of diamonds, there are other things to consider when choosing a diamond, chief amongst them, the shape. Here weâ€™ll focus on the shape and two of the Câ€™s; cut and carat. Clarity and color can be saved for another day. With so many shapes out there it can be confusing as to the actual differences, so let’s simply talk about each of them and their individual merits. ” Round” the most basic of diamonds, and the only shape not considered “fancy,” this shape is very much how it sounds â€“ a rounded diamond in the shape of a circle. “Princess” arguably the most popular shape, this squared diamond has only grown in popularity while still being a relatively new shape. The princess diamond tends to find its way into solitaire engagement rings more than any of the other shapes. “Emerald” a rectangular shaped diamond, this shape is reflective of a classic and aristocratic elegance. Unlike other diamonds, the emerald shaped diamond is not a brilliant cut but rather a step cut, being comprised of larger, planar facets that resemble stair steps and act like mirrors. “Marquise” long and slender, this shape, originally commissioned by Louis XIV of France, is wonderful for maximizing the carat within the setting. The marquise shape will accentuate the length of the fingers and works well on a person with longer fingers. “Oval” as the name implies, this diamond shape is a very simple oval. This shape works very well with smaller hands and shorter fingers, giving them the illusion of added length. â€¢	Pear â€“ a hybrid shape combining the best elements of the oval and marquise shapes, it resembles nothing so much as a teardrop. 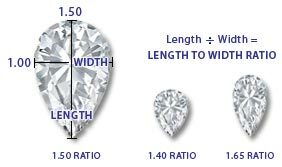 Typically used in pendants and earrings, this shape compliments short to average length fingers, helping to give the illusion of longer fingers much like the oval shaped diamond does. â€¢	Heart â€“ essentially a pear shaped diamond with a cleft at the top, the heart shaped diamond is the ultimate symbol of romance. This shaped diamond is frequently seen in pendants but is more than acceptable as a choice in a ring. â€¢	Radiant â€“ this square or rectangular shaped diamond does an excellent job of combining the elegant and classic appeal of the emerald shape with the brilliance of the round shape. â€¢	Trillion â€“ a wedge of brilliant fire, the trillion shaped diamond was first developed in Amsterdam. Traditionally a triangle shaped diamond, the amount of point at the corners is often open for interpretation, but these diamonds work well as both a compliment to a center stone, a unique center stone in themselves, or as a pair of earrings. â€¢	Baguette â€“ very reminiscent of the emerald shaped diamond, this shape of diamond is frequently used as side stones to a larger center stone. Much like the emerald shaped diamond, the baguette shape doesnâ€™t feature nearly the sparkle of brilliant shaped diamonds, but does offer a classic beauty that is hard to match. The shape is only the first part of what to look for, at least initially, when considering a diamond for an engagement ring. 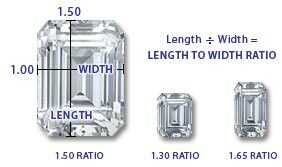 Carats are essentially a way to measure the weight of diamonds. 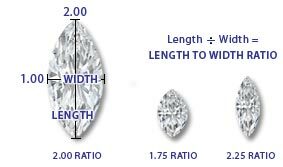 While the use of the carat measuring system may date back to ancient Oriental bazaars and the carob seed, in the present we know that the more carats in the diamond, the bigger it is.